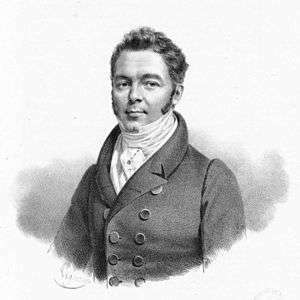 André George(s) Louis Onslow (27 July 1784 – 3 October 1853) was a French composer of English descent. His wealth, position and personal tastes allowed him to pursue a path unfamiliar to most of his French contemporaries, more similar to that of his contemporary German romantic composers; his music also had a strong following in Germany and in England. His principal output was chamber music but he also wrote four symphonies and four operas. Esteemed by many of the critics of his time, his reputation declined swiftly after his death and has only been revived in recent years. Onslow states in his autobiography that his attitude to music was transformed by his experience of hearing the overture to Étienne Méhul's opera Stratonice in Paris in 1801. In Onslow's own later words "On hearing this piece, I experienced so lively an emotion in the depths of my soul that I sensed myself at once penetrated by feelings previously unknown to me; even today this moment is present in my thought. After this, I saw music with other eyes; the veil which had hidden its beauties from me was rent; it became the source of my most intimate joy, and the faithful companion of my life." This led him to compose his first string quintets (Op. 1 nos. 1–3) and string quartets (Op. 4 nos. 1–3), although he had not at this stage received any composition tuition. These were published at his own expense; Onslow was always wealthy and did not need critical or financial support. The critic François-Joseph Fétis noted that, despite his absence of training, Onslow "had all the leisure necessary to overcome these obstacles". Onslow learnt to play the cello, and to play the chamber music of Mozart, Haydn and Beethoven with other local amateurs. However, aware of the need to develop his technical musical skills, in 1808 he began to study composition with Anton Reicha in Paris. At this time he also married a French heiress, Charlotte Françoise Delphine de Fontanges, by whom he was to have three children. Onslow based himself near Clermont-Ferrand, initially at his father's Château de Chalendrat at Mirefleurs (where at the age of six he had planted many of the trees), later at Château de Bellerive at Perignat, La Roche-Noire. He typically visited Paris during the winter (concert) season, when his works were often performed, by musicians including the violinists Pierre Baillot and Théophile Tilmant, and the brothers Dancla, who gave quartet concerts. In 1824 and 1827 his first two operas, L'Alcalde de la vega and Le colporteur, were premiered at the Théâtre Feydeau in Paris under the auspices of the Opéra-Comique. Le colporteur was also produced in Germany, and even (in a very mangled version, in 1831), in London. In 1825 in Paris he met the 16-year-old Felix Mendelssohn, who enjoyed a performance of one of Onslow's quartets but was surprised that he was not aware of Beethoven's opera Fidelio. Onslow was an early enthusiast of the music of Hector Berlioz, whose Eight scenes from Faust (1829) and overture Les francs-juges (1830) he praised. In 1829, after Onslow had commenced his quintet op. 38 (his fifteenth), he was very seriously wounded in a hunting accident, which left him partially deaf in one ear; completing the quintet in the aftermath, he named the final movements "Fever", "Convalescence" and "Recovery". The work was subtitled "De la Balle" ("The Bullet"). In 1831 Onslow was elected the second Honorary Fellow of the Philharmonic Society of London (Felix Mendelssohn had been the first). He wrote for the Society his Second Symphony, Op. 42, and continued to maintain close relations with leading London musicians including John Ella and George Frederick Anderson. In 1834, Frédéric Chopin and Franz Liszt played Onslow's Grand Sonata for four hands Op. 22 at their debut joint performance in Paris. From 1835 to 1838 Onslow was the President of the Athenée musical in Paris, an association founded in 1829 "to propagate the study and the spirit of music", with the intention of bringing together both amateurs and professionals. 1837 saw the premiere in Paris of Onslow's third (and last) opera Le duc de Guise. In 1839 Onslow founded the "Société Philharmonique de Clermont" in which the emigré Polish violinist Alexandre Tarnowski was very active. Performances were given of Onslow's own chamber music, and also of his opera Guise, including passages which had been cut from the Paris performances. At the instigation of Tarnowski Onslow also hosted in Clermont-Ferrand the Polish-Jewish xylophonist and rival of Josef Gusikov, Sankson Jakubowski. Onslow's emphasis on instrumental music, and his base in Clermont-Ferrand, set him apart from many French composers of his era, for whom opera was a principal aspiration – the period after 1830, in particular, was a time when Paris led the world in grand opera. His interest in chamber ensembles and forms seemed to align him more closely with German musical traditions. Moreover, being possessed of an independent fortune, he could write for himself rather than needing to pander to the desires of audiences or impresarios. Fétis complained in 1830 "Nature worked in vain to have a Haydn or a Beethoven born in France; such talent was better concealed in the capital than are diamonds deep in the earth. It was the same with chamber music such as quartets and quintets. If M. Onslow has been able to establish a fine reputation in this genre, it is because his social position renders him independent...he is still better known abroad than in France. The lack of encouragement for instrumental music, a taste for futilities, and other secondary causes which it would be too tedious to detail, have left us insensible to anything but fantasies, variations and other trivia." 1 2 Fétis (1841), p. 90. ↑ d'Ortigue (1833), p. 151. 1 2 3 4 5 6 Niaux (2013). ↑ Todd (2003), pp. 142–143. ↑ Cairns (1999), p. 324, 427. ↑ Hagels (2009), pp. 3–5. ↑ Hagels (2009), pp. 7–9. ↑ Stowell (2003), p. 45, 55. ↑ Hall-Swedley (2011), p. 32. ↑ Niaux (2003), pp. 121–2. ↑ "George Onslow Nonet" on Silvertrust Editions website, accessed 15 September 2014. ↑ "String Quintet No.19 in c minor, Op.44" on Silvertrust Editions website, accessed 15 September 2014. ↑ Cited in Niaux (2009), pp. 1–2. ↑ Niaux (2009), p. 2. ↑ Niaux (2009), p. 5. ↑ d'Ortigue (1833), p. 154. ↑ Sowell (2003), pp. 239–240. ↑ Davison (1912), p. 170. ↑ "Discography" on the George Onslow website, accessed 18 September 2014.